Our clients asked, we answered! Check out our new and improved schedule! Our Flex Packages give you the freedom to schedule classes that fit best for you, and they never expire. We offer many different membership options to fit your busy schedule. Want to join in on as many classes as possible? Buy one of our Exclusive Membership Passes. Feel free to give us a call, send us an e-mail, or check our FAQ! 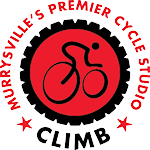 CLIMB is Murrysville’s new premier cycling studio opening. Located in the heart of Murrysville at the Sportzone. Find out what is going on at our studio! Want to join in on as many classes as possible? Buy one of our Exclusive Membership Passes!